Cool Season turf grasses are best adapted to growing during the cool and moist periods of the year and do most of their growing in the UK during late spring/early summer. In a decent summer you will see growth rate tail off in mid summer and this will usually be followed by another growth spurt in late summer/early autumn. The cool season grasses are best adapted to grow well in temperatures ranging from 150 to 240 C. This group includes all of the usual turf forming suspects that are common in the UK such as Agrostis (Bent grasses), Poa (meadow grasses), Festuca (fescues) and Lolium (rye grasses). 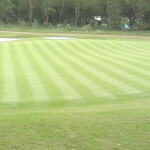 The warm season turf grasses are best adapted to growth in the temperature range of 270 to 350 C, they grow best during the warmest part of the year and can go dormant and even suffer injury during cold weather. 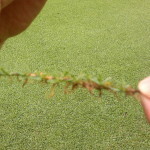 Dormancy typically kicks in at around 10 degrees when the entire turf will take on a yellow colour. Examples of the warm season grasses that some of our American, Australian and South African readers will be familiar with are Axonopus (Carpet grass), Cynodon (Bermuda grass), Paspalum (Bahia grass and Seashore paspallum) and Zoysia (Zoysia grass). The main difference between the two groups is the way in which they photosynthesise or produce food for themselves. The first product of photosynthesis in cool season grasses is a 3 Carbon sugar molecule so these grasses are commonly referred to as C3 grasses. In warm season grasses the first product of photosynthesis is a 4 Carbon sugar molecule, so they are referred to as C4 grasses. C4 photosynthesis is thought to be an evolutionary adaptation that has allowed grasses to thrive in very warm and tropical environments. However, there is a band of territories around the world where the annual climatic conditions are not suitable for one type of turfgrass all year round, especially if you want to produce a nice green turf. It is too hot in summer for cool season grasses to stay healthy and too cold in winter for the warm season grasses. This is called the transition zone and turf managers in these areas sometimes use over seeding methods to produce an actively growing, green stand of turf all year round. This typically means that they will over sow their warm season turf with rye grass seed in the autumn and the turf will transition from warm to cool season grass in the winter. When spring comes they will put undue stress on the cool season grass in order to make room for the recovering warm season species to take over again. 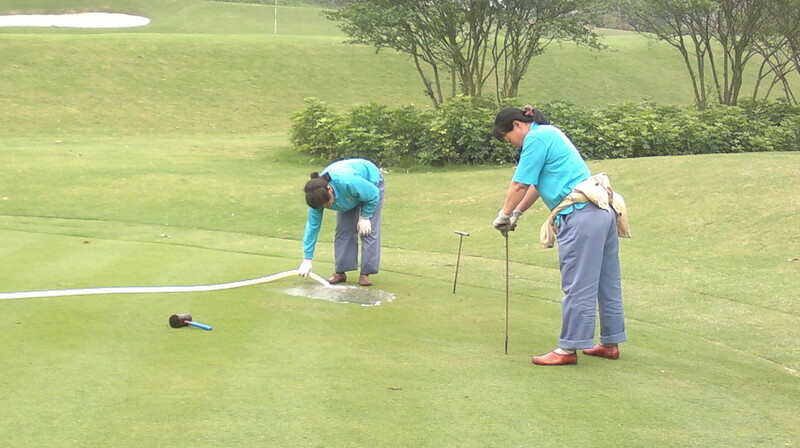 I was recently teaching golf industry professionals in Southern China, which is in this transition zone and the golf club where I was staying has gone to extreme lengths to make sure its customers are kept happy all year round. They have two greens at every hole, one with creeping bentgrass for the winter period and one with seashore paspallum for the summer period. I will write a bit more on photosynthesis soon. Meantime if you have any questions just drop me a line as usual or leave a comment on this post.